This is a page that I painted for the Marvel origin books that were published by Disney. It was also published as the cover for a Golden Book, The Courageous Captain America. I'm glad Disney owns Marvel. mmm, PERFECT MAN!! GREAT WORK JPRart! Just great. Would look lovely next to the original Bowen Cap statue. Wow. 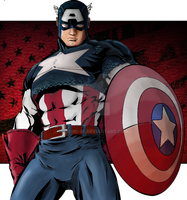 Can't understand why Cap didn't look this way in the movie! "Um Captain...What are you doing in my office." That is some truly stunning work on the Captain! Awesome stuff! Would love for you to check out my stuff and tell me what you think! I feel like I could tap that shield and it would go "ding." Awsome! I just watched the movie! Man, I LOVED that Bowen Designs Cap statue. very beautiful colors and work here. This is going to the be most HEROIC tax debate meeting EVER. How do you get such a clean shield effect? I saw that book in Target. Great job! Did you do the pencils and paint up?